I’ve been working on some illustration techniques, to try to make illustrations for a project I am working on. I am most definitely not an illustrator (a glance at my work will “illustrate” that) but I’m trying to learn a bit; this technique of tracing over an existing image works well, but it becomes very important to capture the right image to use- bad angles, weird shadows, and other things that get in the way will make your traced-over illustration particularly inaccurate. In this case, I cut’n’pasted the 5 different shots I was working with into a single doc for your viewing (dis)pleasure; this does not represent the layout or anything of that nature, so don’t worry about that. I threw some shadows onto the illustration in the upper right corner to try out a technique for doing that- I’m reasonably pleased with the results, but it needs some tweaking, and some better attention to light source directionality. Also, it was suggested in the comments on the flickr photo that I add an additional step between (4) and (5), with which I agree. I had thought there was a little bit of a leap there, for the uninitiated, and I received some confirmation on that. Others suggested no need for the shading, which is also possible- would good shading help? I will have to try changing it so the shading helps to directly indicate the paper’s direction, as I’m noticing from the thumbnail that this one is a bit confusing. But all in all, I am thinking this technique is more clear than photos, at least for showing the basics of tessellation folding. Ultimately, folding complex tessellation pieces requires a lot of attention to detail and understanding the basics, more than anything. So I am thinking that with a stronger emphasis on the basics, less can be said about the complex pieces, in terms of in-depth step-by-step instructions. Is this wrong thinking on my part? Does everyone need rigorous, fully-illustrated step-by-step instructions for everything, even if it is a tessellation including potentially thousands of separate folds? Because if that’s the case, then any sort of actual folding instruction would be impossible. I like to think that tessellation folders reach a certain point where they suddenly “get it”, and a light bulb goes off in their mind- they instantly have understanding of how the concept works, and what is required to not only fold the tessellation they are working on, but any other tessellation they might want to create as well. Yes I also think that an additional step between 4 and 5 would make it more clear. But it looks really good. Which program has you used to create it? I added an additional step, will post an updated version for public commentary soon. I think it works out, there is very few ways to easily show 3D origami folding with the proper perspective, and taking photos (for the book) isn’t really a feasible option. 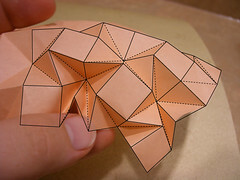 [quote=”Eric Gjerde”]Ultimately, folding complex tessellation pieces requires a lot of attention to detail and understanding the basics, more than anything. So I am thinking that with a stronger emphasis on the basics, less can be said about the complex pieces, in terms of in-depth step-by-step instructions. Absolutely. It’s like that with pretty much anything though. In-depth directions would certainly help you quickly learn a model, but in the long run, it wouldn’t help you too much unless you took the time to splice the model into the basic pattern, and that’s circuitous. I think that to some extent people who want full-detail, every-single-fold-documented diagrams will probably have to go fold something else. I can’t see anyone having the patience to diagram such a thing, when it’s mostly unnecessary. I certainly don’t have the patience for that.